Please join with other animal advocates to protest the brutal business of horse racing at Saratoga Race Course. Let’s make this a HUGE protest! We need to get as many people as we can to stand up to the thousands going into the track this day. We know there are many, many of you who care about these magnificent animals. Please join us to show how many care. 2,000 horses die on or at American tracks each year! Thousands more die at the slaughterhouse bound for a dinner plate in Europe. Signs and leaflets will be provided. Homemade signs make a big impact as well. This is the day after opening day. 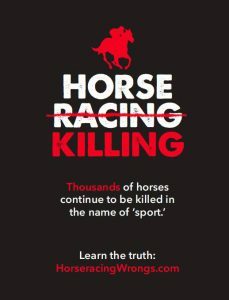 Go to Horseracing Wrongs on FB or horseracingwrongs.com to learn more!